The exercises on this page are ones you can do at home to help with common shoulder problems. If any of these exercises make your pain worse, stop doing them and consult your GP or physiotherapist. You should also see a health professional if you aren't getting better within a week of doing these exercises. Hold a stick a shoulder width apart. Lift the stick forward and upward as far as you can go. Then return to the starting position. Repeat this 10 times. Hold a stick in front of you. 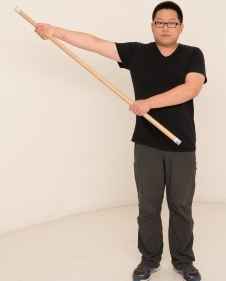 Move the stick by pushing your affected arm out to the side. Then return to the starting position. Repeat this 10 times. Grasp a towel at either end, behind your back. 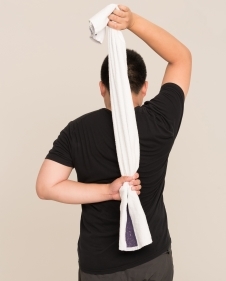 Stand with your affected arm below and your unaffected arm above, then try to dry your back using the towel. Use your upper hand to pull the lower hand upward, then hold it for five to 10 seconds. Repeat this 10 times. Lean on a table with your unaffected arm. Swing your affected arm outward and inward, like a pendulum. Let gravity do most of the work. Do this for two to three minutes. Lean on a table with your unaffected arm. Swing your affected arm backwards and forwards, like a pendulum. Let gravity do most of the work. Do this for two to three minutes. Grasp your hands behind your back. Pull both arms backward to create tension in the front of your shoulders. Hold for 30 to 60 seconds. Repeat this five times. 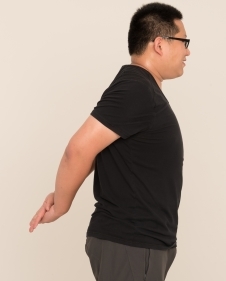 Sitting tall, move your shoulder blades forwards, then backwards as far as you can take them. Squeeze your shoulder blades together at the back, and hold for three seconds. Repeat this 10 times. 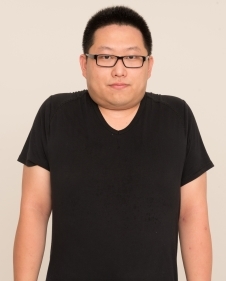 Sitting tall, hold a towel between your body and your elbow. Squeeze the towel to your body and hold for three seconds. Repeat this 10 times. Sit or stand in a relaxed position. Shrug your shoulders up to your ears and hold for three seconds. Lower them down as far as you can go. Repeat this 10 times. Sit tall, with your affected arm by your side, bent at your elbow. Place your other fist into your hand, and push hard into your fist as if trying to move it across your belly. If it hurts, ease off slightly. Hold for 30 seconds. Repeat five times. 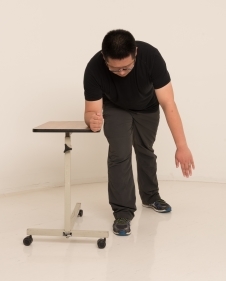 Sit tall with your affected arm by your side, bent at your elbow. Reach across and under with your strong hand. Push hard out against it. If it hurts, ease off slightly. Hold for 30 seconds. Repeat five times. Written by a Canterbury physiotherapist. Adapted by HealthInfo clinical advisers. Page created July 2017.